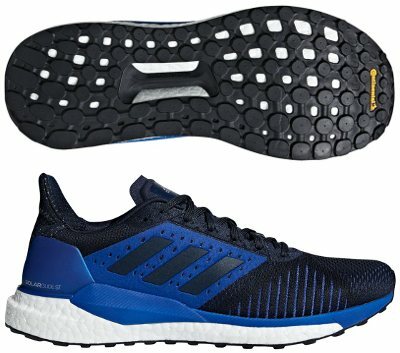 Adidas Solar Glide ST are stability cushioned running shoes. The brand new Adidas Solar Glide ST has been unveiled following Solar lineup peers the premium Solar Boost and its counterpart for neutral runners Solar Glide. All these name changing started with last Sequence (Supernova Sequence Boost 9) whose successor was named simply Supernova ST and finally ends in current Solar Glide ST. It feels that running shoe with pronation support is just an extension (ST from STability) of the neutral one and not an specific product. There are no big changes but product development compared to its predecessor Supernova ST. New Flex Fold mesh in upper adapts better and includes a couple of lateral panels that embrace midfoot for secure and snug fit. Rear zone is typical from german brand with S-Curve elevation to better protect Achilles area and molded FitCounter for enhanced stability, a similar solution used in its bigger sibling, the premium Ultra Boost ST. Although not explicitly stated in official name, midsole in Solar Glide ST is made of different density Boost™ foam featuring great cushioning and progressive pronation support. To increase stability there is available classical Torsion® system and also lateral reinforcements (Solar Propulsion Rails) also seen in other running shoes from Solar lineup. Outsole repeats excellent StretchWeb™ configuration developed in partnership with renowned tyre manufacturer Continental™ with more rubber density in the inside area to contribute in pronation support.